yranny is here. The grim future foretold in 1984 has become reality. The United States is now recognized globally as one of the most oppressive police states on earth. And it's only getting worse. 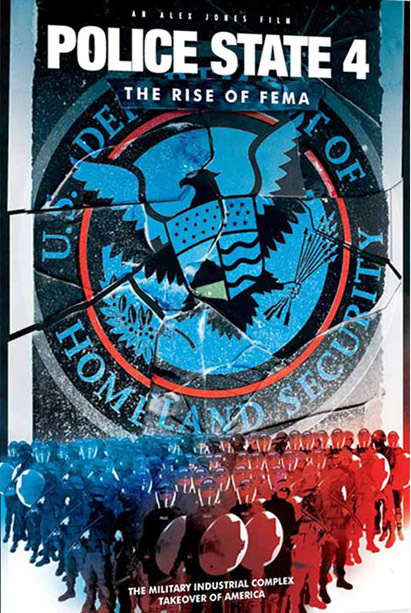 Police State 4: The Rise Of FEMA chronicles the sickening depths to which our republic has fallen. Veteran documentary filmmaker Alex Jones conclusively proves the existence of a secret network of FEMA camps, now being expanded nationwide. The military-industrial complex is transforming our once free nation into a giant prison camp. A cashless society control grid, constructed in the name of fighting terrorism, was actually built to enslave the American people. Body scanners, sound cannons, citizen spies, staged terror and cameras on every street corner — it's only the beginning of the New World Order's hellish plan.